Argan oil is beneficial for your hair because it provides a huge dose of moisture to dry scalp or dying hair. It’s also great for your skin! If you’re not sure how to get started, we’ve got you covered with our argan oil buying guide. We’ve compiled the best argan oils that you can buy to help your hair out! But before you go out and start shopping, here are some things that you should know. Organic: Organic products are made entirely with natural, plant-based products that you can find in nature. They aren’t over processed and contain no additives or harsh chemicals that you might find elsewhere. It’s good for you! Cold Pressed: Any type of cold-pressed oil is never heated in the manufacturing process, so it still retains all of the minerals and things that you’re looking for from your hair or skin treatment. It keeps the good stuff in! Application: This only refers to how you get it out of the bottle. Most argan oils come with a dropper for easy application, while others are a spray or, in its simplest form, a bottle you pour from. Pure Oil: Is there anything added to the oil? Some people want their oil to be completely pure and from the source, so this is why we have included this information. It’s the best form of argan oil! Package Size: How much are you getting? Remember, a little of this oil goes a long way, so don’t be turned off by smaller sizes that you’d think. Chances are it’ll still last you a long time. Sulfate Free: Sulfates are cleaning agents that clean away grease and grime. Sometimes, this can be a bad thing and can strip all the natural oils from your skin as well. Sulfate-free mixtures don’t have any of these abrasive chemicals. Let’s get to our argan oil reviews now! We’ve searched, researched, and reviewed a ton of different argan oils to bring you the best ones, the only ones we thought to be worth buying. If you’re short on time, take a look at our top pick and budget pick first, as they’ll show you what’s available. But don’t discount the rest of the oils on our list, either! They’re all great, effective products. 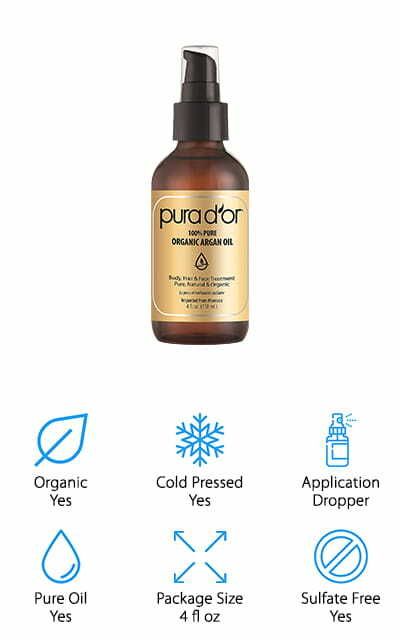 Our pick for the best argan oil for sale is this oil by Pura D’Or. It’s a pure oil that you can use daily to help restore moisture to your skin and hair. It helps to restore the proper nutrients to your hair and your skin. This particular oil is completely organic and free of sulfates and pesticides. There are no artificial colors or fragrances, no harmful chemicals present, and it’s also gluten-free. You can use it to make your hair moist again and to help liven dead hair, but also on your face to soften lines and make your skin elastic again. It’s cold-pressed, so it’s still full of nutrients that weren’t taken out by the manufacturing process. It’s also gentle enough to use on your skin and hair daily, no matter what type of hair or skin you have. For moisturized, revitalized hair and skin, get the best argan oil that you can get! For best cheap argan oil, we have this Aria Starr product. It’s organic, made with only the most natural ingredients, as well as produced in Morocco. To preserve the best of this oil, it is sold in these amber glass bottles – that is pretty serious! You can get soft skin and shiny hair in moments with the application of this oil. Over time, it can help to make your skin glow beautifully and previously frizzy hair remains tamed, sleek, and beautiful! Even sensitive skin is no match for this argan oil – this non-greasy formula with no fragrance will relieve even the flakiest skin, all while putting out a deliciously raw scent. It’s not overwhelming, but you can definitely tell that it’s a natural product. And when you rub this stuff on your skin, it disappears within a few moments. And what’s more, there’s a one-year satisfaction guarantee. If you aren’t happy, get a refund! Next up on our list is a mixture that we consider one of the best argan oils for hair. It’s not just argan oil: it’s an argan-oil infused hair treatment. This helps to prevent split ends because the oil absorbs quickly into individual strands of your hair and penetrates deeply into the shaft. This helps to make hair stronger overall while working to reduce the overall number of split ends. Have soft and shiny hair again in no time! We love how lightweight this product is, not heavy like a lot of other oils tend to be. If you want to ditch your frizzy hair for good (or even just for a special occasion), you definitely need some of this hair treatment. It’s great to use after straightening and curling as well because it can help to reduce some of the damage those devices do to your hair. It’s also full of antioxidants to help keep your hair healthy. Voila Ve makes the best organic argan oil for your face, or at least one of them! There are absolutely no fillers in this mixture and nothing that would take away from the 100% pure oil rating. They are certified Organic so they’re only using the good stuff, and proudly display the USDA certification on the label of their products. What makes this oil great for your face is the pureness of it and the availability to put it just about anywhere and get great results. It’s highly versatile! Have rough skin on your elbows? Get some of this oil. Dry hair or brittle nails? Just apply this stuff. It’s 100% cold pressed as well, so it’s full of vitamins and minerals that wouldn’t be there if it was overly processed. It’s full of things like fatty acids, Vitamin E, and other beneficial nutrients. Don’t let your skin dry out – get some of this argan oil today! 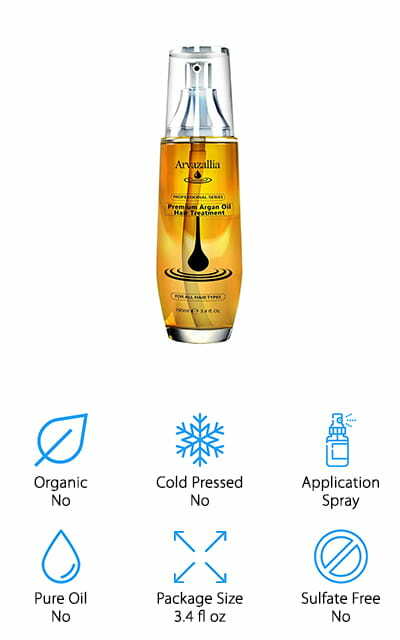 This argan oil by Arvazallia is the perfect treatment for your hair. It will help to cut down on the frizz-level of your hair by helping to restore and strengthen damaged hair. It’s also a heat protectant, so it will protect your hair from further damage caused by styling wands like straighteners and curling irons. Your hair will be easier to manage, as well as becoming softer and silkier – and oh so touchable! The nutrients come straight from high-quality Moroccan argan oil. It also has the potential to help your hair grow as it locks in moisture. What’s cool about this company is that they provide a ton of other products in their argan oil series that you can use together to achieve amazing results, including hair masks and special shampoos and conditioners. It will even leave your scalp feeling moisturized, which can reduce dandruff! For all that it does, your hair needs this treatment – it can only help! 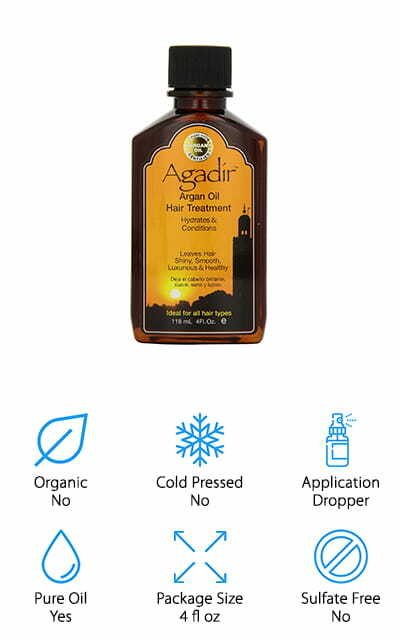 Agadir makes this treatment, which we found to be the best pure argan oil on the market. It’s a complete treatment meant to strengthen your hair, even when it’s brittle or damaged from being overworked. It locks in moisture to help your hair start on the road to recovery, and immediately starts becoming softer! This oil treatment somehow avoids being overly oily, and won’t leave your hair feeling greasy. No one wants heavy, greasy hair, so we found that to be a nice feature of this treatment. Because of the way it keeps the moisture in the strands of your hair, you’ll find that your hair dries faster. It also helps to soothe your itchy scalp and dandruff problems, and because it moisturizes both your hair and your scalp, you’ll be feeling great all over! In fact, it’s so good for your hair that you might notice significant boosts to growth! We think that’s pretty amazing! 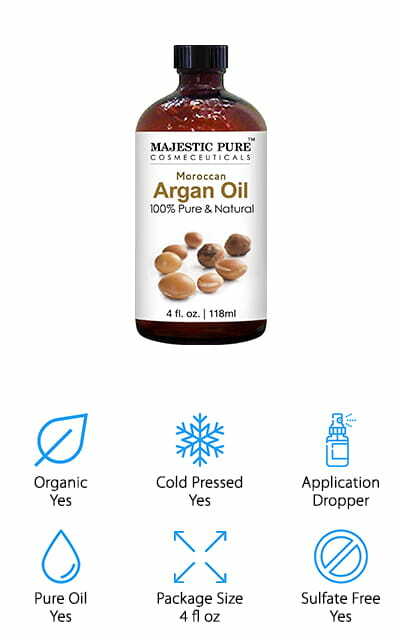 This oil from Majestic Pure is probably one of the best pure argan oils for hair that we found during our research. 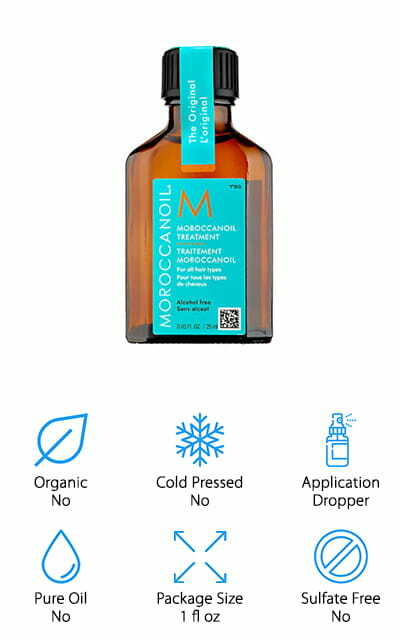 It’s a high-quality, pure Moroccan oil that contains no additional ingredients. It’s been cold pressed in production so that it retains all of the healthy nutrients and properties that make argan oil such a great choice for taking care of your hair and skin. 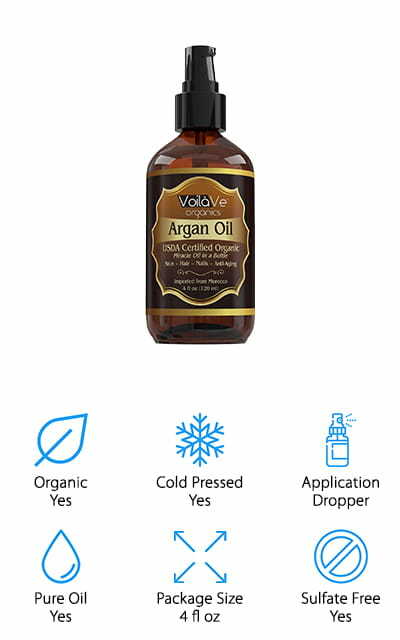 It comes in a dark glass bottle to preserve it for longer while it’s on your shelf, and a dropper so you can always get the oil right where you need it. In addition to being a great hair product, this is also the best argan oil for skin – it helps to moisturize and restore the natural oils in locations all over your body that might feel rough or dry. This oil is silky smooth and smells very faintly of nuts, which is a nice cosmetic touch for this product. 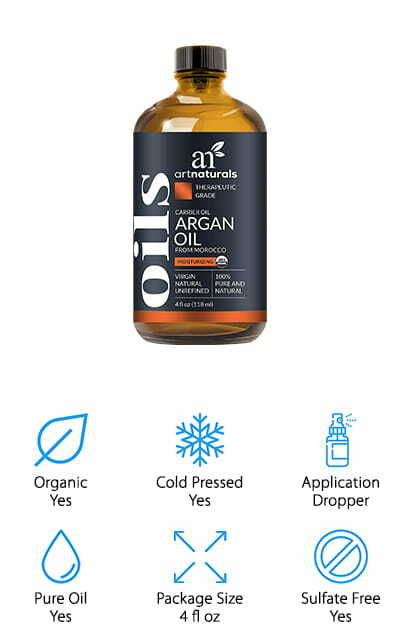 The best organic argan oil is this ArtNaturals product – at least we think so! 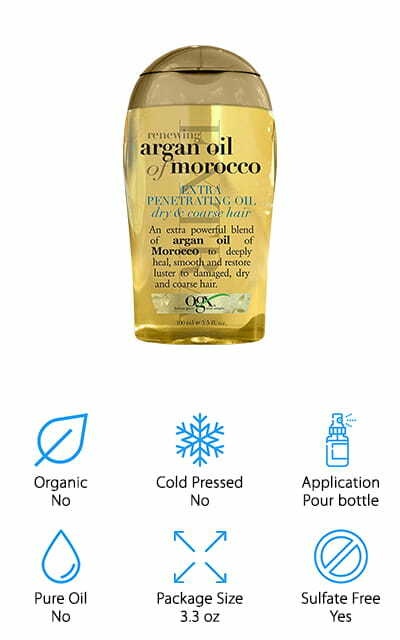 It’s made from cold pressed, completely pure argan oil straight from Morocco. It’s full of healthy fatty acids, which is the key to the healing and restorative properties of this oil. You’ll only need a couple of drops to see how well this product can work, and what it will do for your hair and skin when you need it to. Various uses include treating dry nails and cuticles, prevention for signs of aging, unclogging hair follicles, and it might even make your hair grow! The secret lies in the antioxidant-rich source, which is full of Vitamins E and B. It’s great for you! Get shiny hair, youthful skin, and moisturized nails when you use this product regularly – all amazing benefits from a pure, organic product. It’s also cruelty-free and doesn’t contain any sulfates that strip natural oils off of your hair. Premium Natural Argan Oil is one of the only sprays on our list, which will help you get a wider coverage from your argan oil. Use prior to any sort of blow-drying, curling, or straightening to help lock in the moisture in your hair and protect it from heat. This will also help protect it from humidity and sun damage, which might be an issue depending on where you live. Your hair will come out smooth and shiny, instead of dry and frizzy – and who doesn’t want that? It also has detangling properties, so if your hair usually twists around itself you won’t have to worry about pulling with this product. It makes a great leave-in conditioner after your shower. 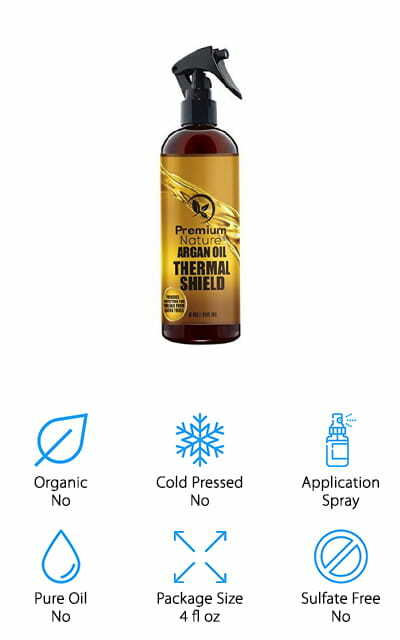 Top all of those benefits and features off with an affordable price and high quality, and we’re absolutely in love with this premium natural argan oil. Get rid of brittle and dry hair and replace it with touchably smooth locks! The last product on our list is this powerful OGX Renewing Argan Oil blend. Your dry, damaged hair doesn’t stand a chance against the incredible moisturizing and renewal properties of this treatment. With just a few drops applied to damp hair and allowed to dry naturally, your hair can retain its natural smoothness no matter how stressed out it is. It will protect your hair against heat and humidity, as well as the heat from your styling tools. Your hair will come away stronger, and full of the luster that you deserve. Apply to damp hair and work through for a light solution to hair that is coarse and stressed out. Instead, you’ll have smooth hair that will make you look and feel great. Whether it’s recent damage that’s made your hair lose its shine or long-term damage, this oil can help you get back to the way your hair used to be. We love it!